Some days back Liberhan Commission submitted a report to the government. You may be wondered what is the similiarities between a commission and an infrastructure project. Let us see. It took 17 years for the commission to submit the report after 48 extentions and an expenditure of 8 crores. 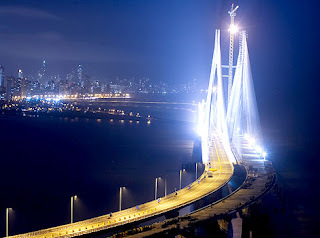 Bandra-Worli sealink, the 5.6km long, India's first and longest bridge to be built over an open sea, opened in the end. Its expected that bridge will reduce the journey time from 45 to 6 minutes. But at what cost? At the time of initialisation of the project the expenditure was estimated at 300 crore but when it completed the expenditure was a wopping 1634 crore. The project took 10 years to complete that means almost 5 years overdue. It may not be a surprise for Indians as we have projects which took more that 10 years to complete, and lay behind the shedule by more than 5 years. All most all government projects are subjected to cost overrun and laying behind the shedule. Indians may be happy that it took only 5 years extra to complete the project!!! Lets look in to difficult infrastructure projects in other parts of the world. The 7.8 km long Öresund Bridge(also called Øresundsbroen,Öresundsbron etc) bridge connecting Denmark and sweeden took only 4 years to complete. It was 3 months ahead of the shedule. 35.6 km long Hangzhau Bay bridge connecting Shanghai and Ningbo took 4 years to complete. 50.5km long Channel tunnel (under sea rail tunnel linking England with France) took only 6 years to complete even if it undergone 80% cost overrun . But in India red tapes, renegotiations in the midway, long delay in gtting the clearences usually lead to the huge cost overrun and delay in the project. In this case the delay is around 5 years and cost was 1634 crore(expected 300 crore). Not only this but there are other flaws associated with the link. The roads taking the cars from the bridge is much narrower than the linkThe problem will be more exposed when all the 8 lanes are opened for public. 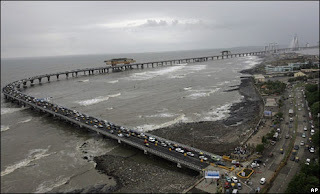 If they can build a 8 lane sea bridge with so much cost why they cant build an appropriate approch road? I dont think Indian's expect an efficiency of Chinese, Europeans or Americans in completing infrastructure projects, but atleast government can do somthing to improve the situation. They can avoid the beaurocratic delays in giving the clearences, delays in awarding the projects(for your information: The trans harbour bridge creek has been bid for twice yet not awarded to anybody). Its not that we are not efficient in executing the project, Delhi Metro is the best example. This Metro Rail project completed with in time and with in the budget. we have to be efficient like them or more than them; otherwise we remain in the closed group of jargons like developing country(not developed country), emerging economy(not emerged economy) etc.